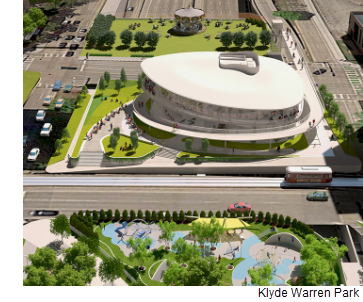 ​​​​​ ​DALLAS – Klyde Warren Park is extending its footprint over Woodall Rodgers Fwy. by an additional 1.2 acres. The $76 million project—a completion of the original plan for the deck park—will expand the park west of North St. Paul Street and will be anchored by a 20,000-sf pavilion in front of the Hunt Consolidated headquarters. The expansion is a joint initiative between the Woodall Rodgers Park Foundation and VisitDallas. Construction is set to begin in 2019 and be completed by 2022. Klyde Warren Park, a $110 million project, opened in October 2012 and currently stretches across 5.2 acres over the highway that separates Downtown from Uptown. The park has generated billions of dollars in development and is one of the most successful infrastructure investments in Dallas’ history.